It's unfortunate that it's more and more difficult (at least where I live) to find whole dried yellow peas. I say that because one of my favorite soups is Habitant Pea Soup, the traditional potage that was basic sustenance for the farmers of Quebec for centuries. Disclosure: I am NOT recommending that you go out and buy this soup! Unfortunately, this would be vegan except for the addition of lard! But the image of the can holds pleasant memories for me because we loved it. (The company was apparently bought out by Campbell's, BTW.) So, I had to learn to make it myself, and then make it vegan-- and it's even better! "Habitant" is a French Canadian term for "country dweller" (more or less) and it's easy to see why it was such a staple for French Canadian farmers, being easy and cheap to make with dried yellow peas that could be stored for a long time. Warming, filling and nutritious, the soup had much to offer these hardworking people during the frigid Quebec winters. You will see many recipes for this soup using split peas, but I think that is partly because of the difficulty of finding the whole ones, or just because split peas are more familiar to many of us. But I like the fact that the whole peas have the skins that float around in the soup (extra fiber) and also the fact that the soup doesn't thicken into a "peas porridge" when cooled. My husband assures me that whole peas are more traditional, and he likes the slightly thinner quality of the the soup when made this way. In any case, I hope you will be able to find some whole yellow dried peas and try my recipe. I have to make it regularly now, because our dog, Pheobe, really likes a little of it on her vegetarian dog kibbles! WHERE TO BUY: You can order whole dried yellow peas from the farm gate here in the USA, and also order them here. In Canada, check health food stores, supermarket bulk bins and natural foods markets. NOTE: Whole peas should be soaked for about 8 hours before cooking. Soak the peas in water to cover generously for about 8 hours, then drain. Mix the soaked peas in a large heavy pot with the broth, vegetables, herbs and spices, liquid smoke, optional "ham", "bacon" or smoked tofu, and sesame oil. Simmer for 2 hours. With a hand/immersion blender, blend just enough to puree some of the peas, but not all. Just pulse briefly around the pot. Taste for salt and pepper. 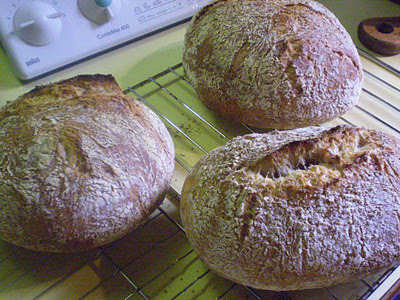 No-Knead Crusty Artisanal Bread from my book "World Vegan Feast". 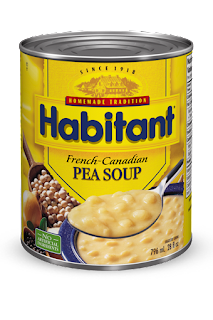 I had no idea that Habitant pea soups were called "French Canadian" soups! I'm a Frenchie and I love pea soup. I actually thought they were made with split peas, since that's all I have ever see in vegan cookbooks (and vegan cookbooks are the only ones I know). The funny thing is that just last week, I got a bag of dried peas from my CSA share, and I was startled to actually see whole peas. I'll make sure to try out your recipe! Merci! Quiltbug, they do look kinda white when dry because the skin covers up the yellow part inside. Here's a photo: http://www.purcellmountainfarms.com/Whole%20Yellow%20Peas.JPG and I'll add it to the blog. This brings back so many memories! I could devore this soup when I was young. I'll add this recipe to my weekend projects. Thank you, Bryanna. I tried it last night and it is pretty good. My peas needed more than 2 hours of cooking though, even though they had soaked for at least 15 hours. They might have been old, Babette-- dried legumes get harder to cook if they are on the shelf for a long time, so try to buy from a store with a good turn-over. I have had a few experiences with kidney beans and pinto beans that just would NOT cook through, even with soaking, regular cooking, and then pressure cooking! "The leading cause of toughness in beans (sounds like I’m about to unveil some scary medical news, huh?) is age. Just because you bought the dried beans from your store last week doesn’t mean they are new. As dried beans age, the pores through which the water enters tend to close and the outer coating may change, too. If water can’t get into the bean, they aren’t going to soften no matter how long you cook them. Yeah, I know about that. I've had a few batch of canary beans and chick peas that just would cook. But I got those whole peas last month from some sort of CSA and I assumed they would be quite fresh. Maybe not! Thanks for posting this recipe! It's hard to find a French Canadian pea soup recipe that uses whole peas. I live in Ontario, Canada and just bought a 900 gram bag of whole yellow peas this morning in my local Food Basics grocery store. Another source of whole yellow peas (and other legumes) is South Asian (or other Asian) markets. I made it exactly as described, and it is good. When I went vegetarian (a few years before going vegan), I reluctantly had to give up Habitant pea soup...possibly my all-time favourite prepared soup...because of the stupid lard. At the 2hr mark, I blended the soup a bit, of course. I simmered it for an additional hour with the lid off, as it was still too watery for my liking. The final product is a tasty vegan soup...enough for a baseball team, in the style of Habitant brand pea soup. I'll check back if/when I make it without the liquid smoke, to see if that works better for me. Oh, I had no trouble finding whole yellow peas at my first stop, my local Metro grocery store. Thank you so much for getting me on the right track! I really appreciate it!! Jody, most certainly flavor it to your own taste! Did you puree some of the soup at the end, as I mentioned in the recipe? This makes it thicker, without being like "peas pudding". I just soaked the whole yellow peas overnight, then added them to some (organic) vegetable broth, with the allspice, garlic, and a bay leaf, and simmered. As I do with my lentil soups, I later removed about half the whole peas, and blended the remainder in the pot, using a hand blender. (I DO like "peas pudding"! The thicker the better, for me!) I replaced the whole peas, and let simmer a little more, adjusting salt content. Seriously. That's it. I skipped everything else, and what I got was pretty darn close to what I remember. Great recipe very similar to how I make this soup. I add a few whole cloves instead of allspice and a couple of bay leaves. I found a good sized bag of yellow peas in Walmart in Campbell River I've usually had to make it with whole green peas. I've just found your website when I googled Vegan whole yellow pea soup and up came your site. I'm looking forward to taking some time to poke through your pages. I live in Quebec and grew up on the Habitant Pea Soup so I needed to try make my own vegan version and this was it. I made the soup minus the smoked ingredients and I just love it. Thank you so much for your delicious recipe. It will be my work lunch for the next few days. Just delicious. Will print it out and keep it in my favourite recipes collection. This one is a real winner. French Canadian peas, whole yellow peas are bing grown again in St - Georges Manitoba! These were brought to the area by settlers from Quebec over a hundred years ago. Finally someone who has a recipe for whole (not split) pea soup. Frankly I love the NO HAM version of Habitant pea soup. I have made it with split peas and it is just not the same. I too love the white skins of the peas floating around in there. I find the ingredients in your recipe interesting however I cannot stand liquid smoke so would leave it out. It is interesting that the Habitant soup has so few ingredients compared to most recipes I find on line.I will probably try your recipe with a few less items and see how it goes? Lately here in Ontario, Canada I have found the whole peas in several grocery stores which was not the case even a year ago? I read somewhere that Canada grows a lot of yellow peas and is the largest producer of them worldwide. Do you have a recipe for their minestrone soup?